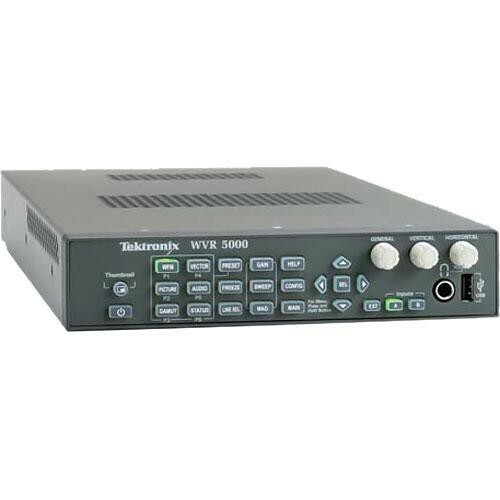 The WVR4000 Multi-Standard Multi-Format Waveform Rasterizer from Tektronix is a solution designed to provide basic audio and video monitoring support. It is housed in a 1RU half-rack chassis. This model supports SD-SDI (ITU-R BT.601) only. This unit offers sharp CRT-like traces, patented gamut displays, picture thumbnails, display freeze, and an error log for 10,000 events. Its user interface features backlit buttons and online help. Commonly used configurations can be programmed and recalled at will with the unit's (32) presets. These preset configurations can even be transferred between units using the device's front-panel USB port. Passive loop-through inputs allow for transparent monitoring at any point of the signal path, even if the instrument is powered down. It also includes an Ethernet port to facilitate downloading screen shots and error logs. Use this unit to monitor SD-SDI signals. It includes a USB and Ethernet port to facilitate data transfer. The unit will accommodate up to (32) presets to instantly recall common configurations. Multiple display and control parameters allow you to customize the unit to meet your exact needs.